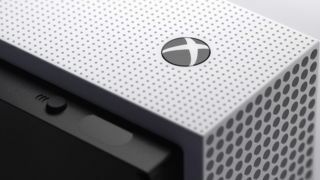 Microsoft is reportedly working on a new Xbox One S which doesn't have a disc drive and only plays digital games, according to a new report from Thurrott. The tech site says it has heard from unnamed sources that the disc-less system is scheduled to release in 2019. The decision to axe the system's disc drive was reportedly driven by two main factors. The first one is obvious: a decisive pivot to digital games. There will always be people who want to own, hold, and collect game discs - such as myself - but there's no denying that digital games have become increasingly popular, especially during this console generation. Secondly, and perhaps just as obviously, a system without a disc drive would be cheaper to produce, meaning Microsoft could sell it at a lower price - $200 or less, in fact, according to Thurrott's report. That's an attractive price point for a new Xbox One, especially if you don't care about physical games. To meet that price, Microsoft would probably have to cut some other corners on top of the disc drive, but they wouldn't quite have to throw out the kitchen sink, so the rumored console should still be reasonably specced. Microsoft is also reportedly preparing a new Xbox One S model which does have a disc drive and is scheduled to release after the disc-less model. This would position the systems as the last hurrah for the Xbox One before Microsoft moves onto its as-yet-unannounced next-gen platform, which the rumor mill has dubbed the Xbox Project Scarlett. Meanwhile, Sony is skipping E3 for the first time in years, quite possibly to prioritize the launch of the PS5.